Three Maine women who run organizations that help kids thrive have at least a few things in common: They all say they’ve found their passion, got to this point on unconventional paths, are mothers—and are kept awake at night worrying about funding. Dwyer, president and CEO of My Place Teen Center since 2011, has had the drive to help children needing extra care since 1991, when her younger son Timothy was born with Down syndrome. She went back to social services, applying for jobs in early 2011, including one at the “old, tired” My Place Teen Center in Westbrook, which offers free after-school and other programming for children aged 10 to 18. “The building was falling in on itself, and it was gross and dirty,” Dwyer says. It didn’t feel like a good fit to her. But then, in the final round of her interview process—a sit-down with a couple dozen kids who regularly attended the center—a girl with bright eyes and dimples startled Dwyer by asking a few unexpected questions that got her to start reconsidering. Struck by the teen’s correct use of “skill sets” for starters, Dwyer answered that no, she wasn’t mean, and yes, she believed she possessed the relevant fundraising and other skills. They took a tour of the red-doored building together. Dwyer knew it would be a monumental challenge, starting with emptying the 10,000-square-foot building of junk. It took six years to fix, renovate or replace everything from the roof to the foundation, she says. At the same time, she was helping to take care of 75 kids every day, and building relationships. “I don’t want to sugarcoat how angst-filled and arduous it really was,” Dwyer says. “And basically my M.O. the whole time was always ‘no means yes.’ You can say no to me 100 times, but eventually you’re going to say yes, because these kids deserve it. 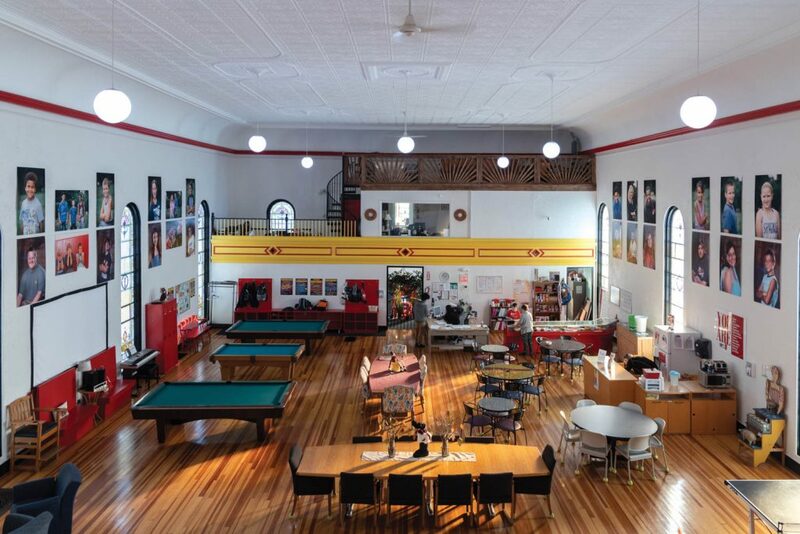 I knew I would be successful in this because of my resilience and drive, and we’ve done everything we set out to do and more.” The “more” includes adding a second location for My Place Teen Center in Biddeford, anticipated to open the summer of 2020. What keeps her driven and energetic? 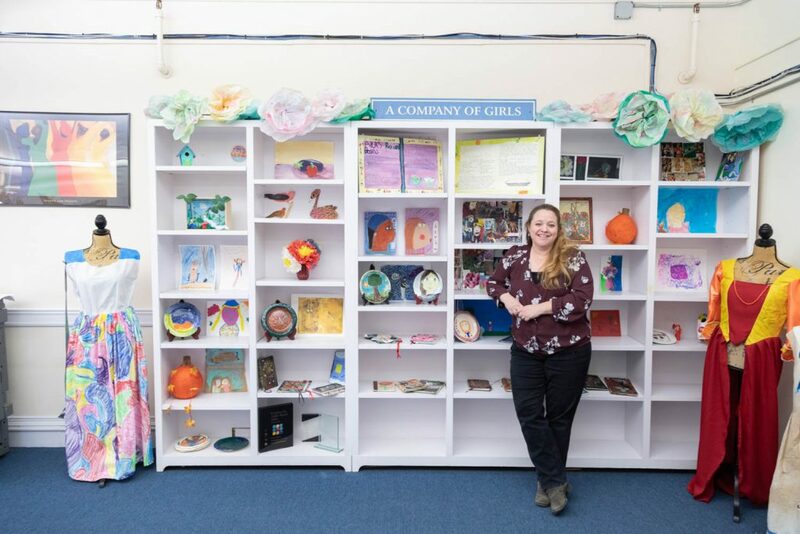 Moving from just outside Washington, D.C., to remote Presque Isle in sixth grade has a lot to do with why Roe feels connected to the work she’s doing now, leading an organization that aims to strengthen and empower—or as it’s often written—empow(h)er—girls and their families and foster community through the arts. “It was a hard time to move, and I can definitely feel myself as a sixth-grader when I’m with these girls now,” says Roe, who started her career as an intern for Portland Stage Co. after studying English, speech and theater at the University of Maine at Presque Isle. Her focus shifted when she was hired for the organization’s marketing department. After a brief stint in New York, she returned to Maine, doing marketing work for the Children’s Museum and Theatre of Maine. At A Company of Girls, participants gather for snacks and games. “It lightens me up to see them build each other up,” says Jennifer Roe of the work she does at the Portland after-school program. Roe left the nonprofit world to start a multimedia company of her own but found she missed interacting with kids. With a flexible schedule, she had time to volunteer and chose A Company of Girls. 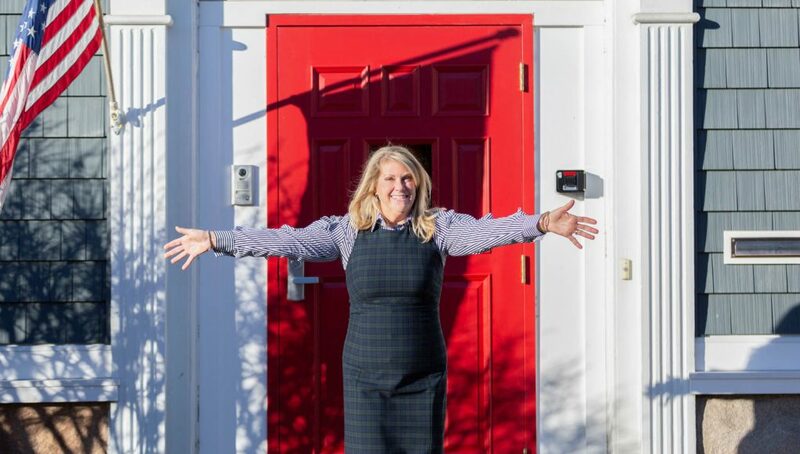 The more time she spent at A Company of Girls, the more she wanted to be there, helping girls—mostly middle-school-age—gain confidence and self worth and spark their creativity through safe and supportive visual, performing and culinary arts programs. So when its founding director left, she and another woman job-shared to fill the director role. 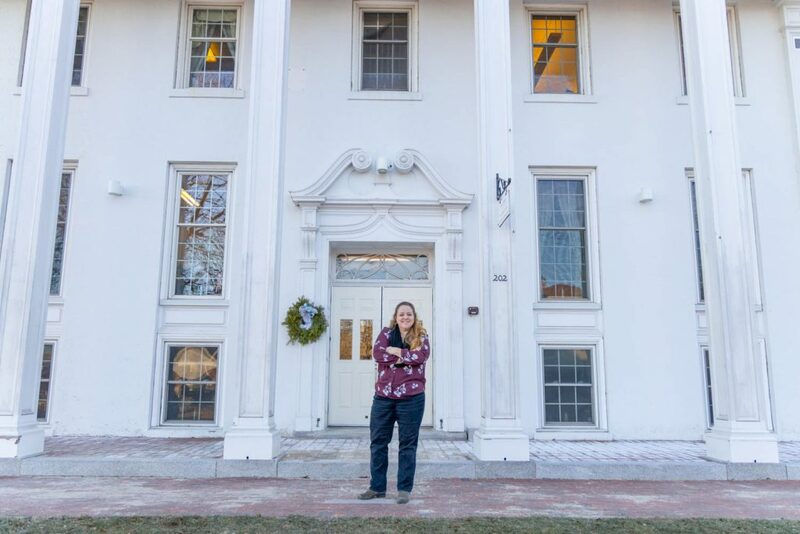 That was eight years ago, and Roe says she loves what she does, supporting 24 girls in an after-school program at Woodfords Church—the organization’s new home as of October—as well as another group that meets at various Portland-area schools. She’s also the primary theater teacher. Ayoob, an artist who has tried many endeavors, is no stranger to change. 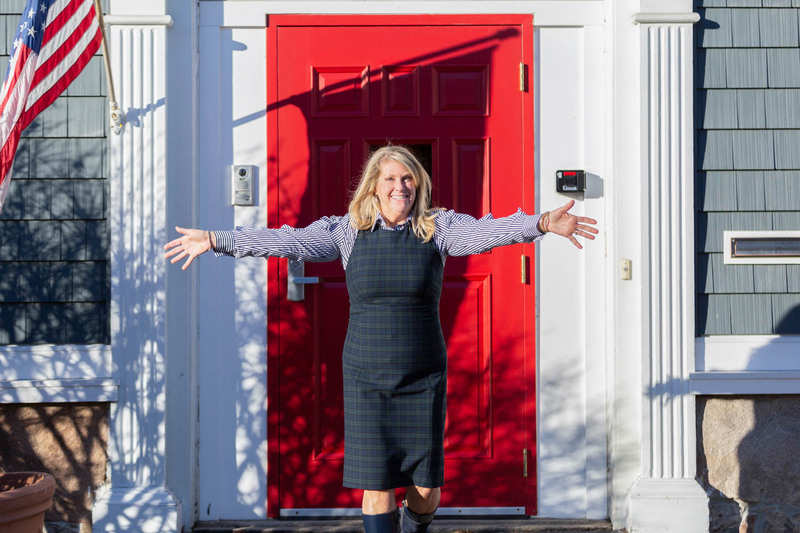 At 50, she went to grad school, and at 54, she opened a locally sourced organic restaurant and art space in Presque Isle. Now the mother of two grown sons teaches photography and Experiences of the Arts part-time at the University of Maine at Presque Isle as well as working nearly full time to make Mainely Girls a success. The organization works in rural Maine communities to empower girls through arts and adventure-based activities, book clubs, mentorships and civic initiatives. When Ayoob heard about its executive director leaving in 2015, she was intrigued and asked if it might be possible to relocate the organization to Aroostook County from midcoast Maine. With approval and the job, she got to work creating a board, adjusting bylaws and figuring out her focus. “My expertise was in the arts and the outdoors, and I wanted to start by making it nature-based and seeing how it developed from there,” says Ayoob, who also has experience with children’s advocacy and running a women’s resource center in the mid-1990s that included a theater component for girls. Acquiring grants was all-important from the get-go and remains essential to Mainely Girls’ success. With a few small grants in hand, Ayoob set up a conference at UMPI, and 33 girls showed up. Next it was a week-long camp in summer 2016, where girls swam, cooked, hiked, bonded and built relationships. Mostly girls in eighth through 10th grades take part, “but we’ll work with any group of girls in the community,” Ayoob says. Two book clubs are thriving, and she’s working to get an apprenticeship or internship program and a theater program up and running. She recently recharged by taking a few months away to put together her own art and musical exhibition at UMPI, incorporating the lyrics and themes of classic folk musicians, including Dave Mallett. But that only crystallized her reasons for leading the organization. Her hope is for current participants to be able to look back as fondly one day. And that depends on her ability to keep securing resources. Patricia McCarthy, a longtime writer, editor and photographer (patriciamccarthy.com), has three daughters and a black Lab, and lives in Cape Elizabeth.